This is an ideal combination of two of the most popular tourist attractions for nature lovers who enjoy hiking in the forest. We’ve combined two of the best sites to visit to enjoy the flora and fauna of the La Fortuna/Arenal Volcano area. We will pick you up at your hotel and take you to the Mistico Park where you’ll enjoy a spectacular hike on the trails and hanging bridges at the park. During this two hour hike you’ll cross hanging/suspended bridges, solid/anchored bridges, and trails through the forest making for an unforgettable experience. During the tour you can enjoy different types of animals like monkeys, snakes, and birds as well as a waterfall located inside the park. At the end of the Hanging Bridges tour you’ll enjoy a delicious typical Costa Rican lunch before continuing on with your second activity of the day. 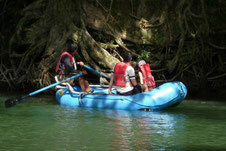 The River Safari in an inflatable raft or kayak on the Peñas Blancas River is one of the most popular activities for travelers to the area. 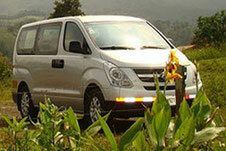 Located thirty minutes from La Fortuna, this tour allows you to see animals in their natural habitat. During the tour you’ll be able to see and photograph different animals like monkeys, caimans (a relative of the alligator), and crocodiles. Our expert naturalist guides make this an entertaining and safe activity that you can enjoy with friends or as a family. 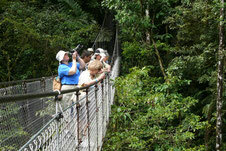 One day nature excursion combining Hanging Bridge Hiking and a River Safari on the Peñas Blancas River. Please send us your inquiry about this outing, we will be glad of assisting you very soon.